Winter's approach doesn't mean you have to abandon the tasty world of fruits for the heavier desserts often associated with the darker, chillier months. Surprise the after-dinner crowd with a delicious fruit dessert. 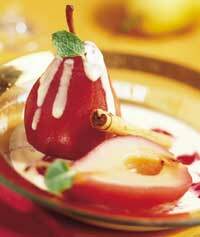 refrigerator and serve cold, or serve warm with a sprinkle of cinnamon or scoop of vanilla frozen yogurt. dish in about five minutes, and it looks marvelous. flame dies down, serve over ice cream.